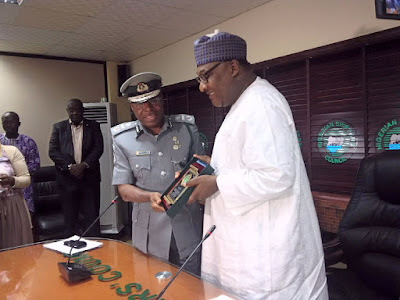 Both agencies held talks at the visit of the Assistant Comptroller General (ACG) of Customs Zone ‘A’, Eporwei Edike, on a courtesy call to the Executive Secretary of the Nigerian Shippers’ Council, Barr. Hassan Bello on Friday in Lagos. Edike said his understanding the sensitive demands of trade and the role of the Service, led him on the visit to get first-hand information of areas that need to be addressed immediately for improvement. Appreciating Edike’s working visit, Bello solicited for the support and continued collaboration of the Nigeria Customs Service to achieve a competitive port system for trade services. He said : “We believe that modern trade facilitation is anchored on automation, on ICT, electronic interface. This will bring about the much needed transparency, efficiency, and it support collaboration. “You recall that automation of the port for cargo clearance is one of the cardinal functions of the NSC. But we need the customs for us to come together frequently as much as possible, so people will know we are serious about this automation in the ports. “Now, there is corruption in the port system, and this corruption, one of the easiest ways to check it is through ICT. We have been to many ports even in our sub region where human contact is minimal and with automation, human contact becomes minimal. On full automation of cargo clearance procedure at the sea port through the use of Single Window System, the ACG said the Service would continue to be alive to its responsibility to ensure a success of the single window system, even as the shipper’s council urged the customs to champion the full take off. According to Bello, an effective single window system would readily support the transportation minister’s quest to achieving the 48- hour cargo clearance mandate given to the Nigerian Shippers’ Council and the Customs Service. Bello said if the seaports operated round the clock every day, and with efficient automated system, revenue leakages would be plugged and the customs service would generate more revenue for government. The shippers’ council boss used the opportunity to call on government to create conducive atmosphere for investment; to protect the investments and guarantee investors’ profits. On his part, ACG Edike said the Comptroller-General of Customs, Col. Hammed Ali(Rtd.) had concluded plans for the purchase of new scanners at the ports to ensure better service delivery. He said that the customs was conscious about the critical duty of the scanners and would be most pleased to set the pace for efficient service to the trading public. He gave his word that regarding the complaints for urgency in attending to letters from the Council, the zonal office would work with the headquarters to ensure prompt responses, even as he encouraged more ‘personal touch’ to be applied. Edike also said the customs would continue in its support to ensure steady progress of the dry ports, as a way of encouraging more cargo to Nigerian ports. Bello had earlier told the ACG that with a lot of administrative issues needed to be discussed with all stakeholders concerned as the Kaduna Dry Port could now operate as a port of destination and origin. He told the ACG that operators of the dry port wanted to meet with the customs, and all other stakeholders, adding that when fully operational, trucks would no longer come from the axis to congest Apapa. The Executive Secretary looked forward to more collaboration and training with the Nigeria Customs Service, for improved port services.